Java is the most popular programming language for Android apps. 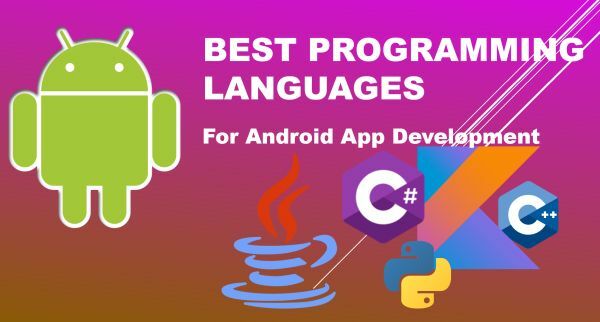 Learn what the best programming language is for Android app development. Do you want to build your next Android app but aren’t sure what programming language is the best for you? In this article, I cover Android app development programming languages for your next app development. Android is the most adopted operating system in the world. Android was developed by Google and is a Linux-based open source operating system. Android being open source, any company or individual can download and use it for their products. Originally, the Android operating system was created by Android Inc. for digital cameras and mobiles. Android Inc. was acquired by Google in 2005. Today, there are 2.3 billion Android Smartphones in the world. Not only does Android power a couple of billion smart phones, laptops, tablets, and PCs, but Android also is the heart and soul of a billion-plus other devices that you use in your everyday life. Some of these devices include TVs, Home Security Systems, Refrigerators, TV boxes, Mini PCS, Karaoke Machines, Cameras, Cars, Navigation Systems, Amazon Fire TV, Smart Watches, Gaming Consoles, and Smart Home devices. What programming languages can be used to develop Android mobile apps? Here is a list of the most popular programming languages used to develop Android apps. Java is the most popular programming language in the word. Java is a static, type safe, general purpose open-source programming language. Java has been the primary programming language of Android since the operating system was launched. Java was created by James Gosling in 1995 at Sun Microsystems. Java is currently owned by Oracle Corporation. Java was created based on C++ syntaxes so developers will find it familiar to learn. Java along with C++ are the best programming languages for students and beginner developers to learn the basics of programming. Java language is adopted by many colleges and universities as a primary first programming language to teach programming syntaxes. Unlike Swift, Kotlin, and C#, Java may not be a modern programming language and does not upgrade frequently. Java however, offers a starting point for new developers. Java is much easier to learn compared to Kotlin. If you’re a new developer who wants to learn Android development, Java may be one of the easiest ways to begin. Kotlin is a modern, concise, safe, object-oriented, and cross-platform programming language that was created by a software product company, JetBrains, in 2011. Kotlin is used to build JVM, Android, Browser, and Native apps. Currently, Kotlin is supported by Google under the Kotlin Foundation. Since the release of Android Studio 3.0 in Oct 2017, Kotlin has been announced as the official programming language of Android. Kotlin is designed to build modern apps and provides the functionality modern app developers need. Kotlin development is seamless via Android Studio. Kotlin offers simplicity, flexibility, and productivity. Kotlin also writes cleaner and less code for the same functionality in Java. For your next Android mobile app, I highly recommend using Kotlin. Some of the popular android apps that have migrated from Java to Kotlin are Trello, Basecamp, Square, Evernote, and Corda. To learn Kotlin, here is a complete training course on Kotlin. The C# language was created by Anders Hejlsberg at Microsoft and launched in 2000. C# is a simple, modern, flexible, object-oriented, safe, and open source programming language. C# is one of the most versatile programming languages in the world. C# allows developers to build all kind of applications including Windows clients, consoles, Web apps, mobile apps, and backend systems. C# developers can build native iOS and Android mobile apps with the help of Xamarin. Xamarin is a tool as a part of Visual Studio which allows developers to write C# code that is compiled to native iOS and native Android binaries. These binaries work exactly as any native app written using other iOS and Android languages such as Swift or Kotlin works. C# offers developers the ability to build native iOS and Android mobile apps without learning a new programming language. Check out What C# Can Do For You. In Android app development, Python is used to create libraries, functions, and back end processing tasks. C++ is one of the oldest and most popular programming languages. C++ is not used to build user interfaces or app pages. C++ is also not used to build controls in apps. In Android development, C++ is used to build APIs and backend tasks. App front end developers are not involved in C++ development but the back end functionality and APIs are often written in C++. There are several popular built-in C++ libraries available for Android developers to use in their apps. HTML 5 combines with CSS, and other technologies can be used to build Android hybrid apps. These apps are not native apps. Hybrid apps wraps around a browser control and use HTML and CSS to render pages within the apps. Android is the most used operating system in the world. Java and Kotlin are two main programming languages used to build Android apps. While Java is an older programming language, Kotlin is a modern, fast, clear, and evolving programming language. If you’re a new developer who wants to get involved with Android app development, my recommendation would be Kotlin.